Haven't stepped out since the last few days ...been catching up on sleep+reading...so today's installment of spring snaps are a few days old. 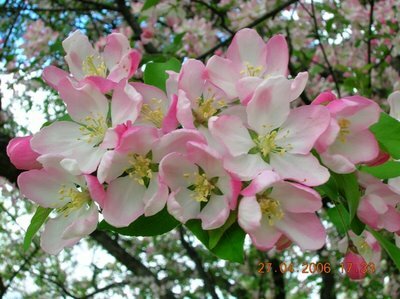 These snaps are those of pyrus coronaria now referred to as malus coronaria - the blossom of the apple tree. 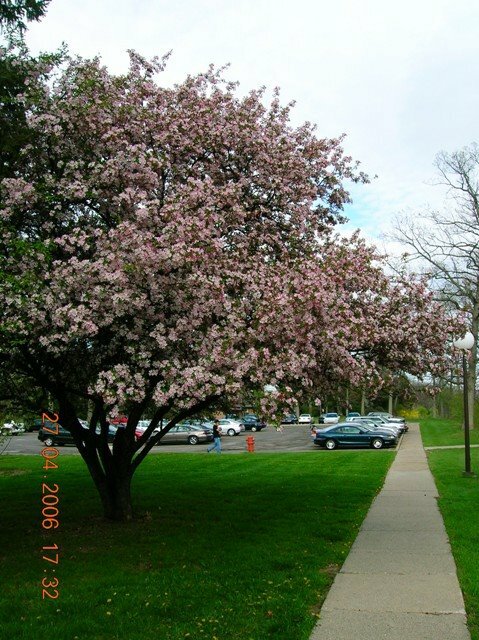 By a nice coincidence, these snaps were taken on 27th April almost exactly 109 years after the flower was declared the state flower of Michigan (28th April 1897). 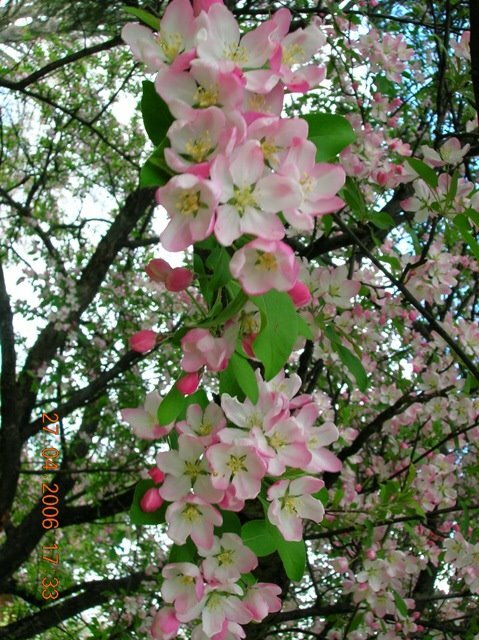 The legislation does not refer to pyrus coronaria specifically but refers to the apple tree blossom in general. 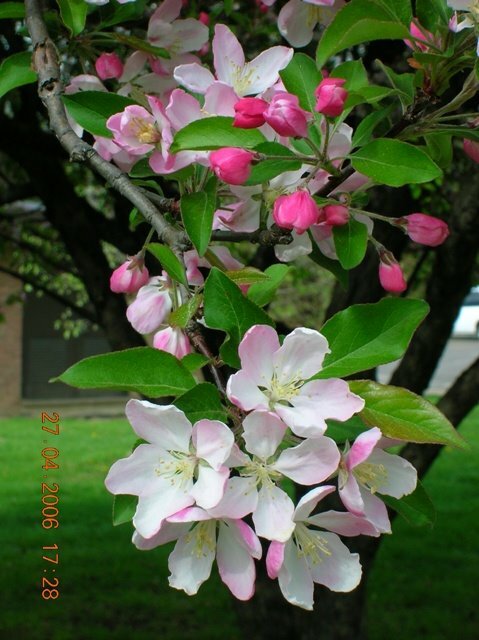 Also just learnt that Michigan ranks 3rd in the US in apple production after Washington and New York. Now, why is the title of the post thus? Because, apparently the saying is not nutritionally true! So next time someone offers you an apple and starts with 'An Ap..' stop her/him immediately and tell the person that apples are rich in flavor, sugar and starch but poorer in vitamins than other common foods. http://www.newton.dep.anl.gov/natbltn/200-299/nb277.htm. However, be warned that this link has info that dates to 1968. As for the 'latest' resarch - apparently they discovered in 2003 that apples (especially in their skins - so don't peel the skin while having apples) contain 16 different biologic polyphenols - and also components that fight cancer and cardiovascular disease. But then, there is also data on hand that tells us that apples are one of the most pesticide-contaminated fruits (ranks third with peaches and strawberries before it). So as usual the scientists have confused us...now we don't know net net whether its good to have apples or should we have something else...as for me, if i feel like having an apple, i'll just have it! Why think so much? And lastly, who coined "An Apple a day..."? Benjamin Franklin. Now i see the same passion in you... You did a similar research on Apples and i must say it was quite interesting! The only difference being that Mr. Saldanha believes in reading the books and you, keeping up with our generation that follows "Hi Tech, Hi Touch", have done the research through the net. Jesus...had forgotten about 'Hi tech, Hi touch'!...thanks for reminding me! We had made a ppt on it too (1999? )...should dig up our archives and see if we still have that...will be either a good laugh or good re-learning!